We are now less than a month away from Father’s Day—do you have any idea what you’re going to get for the important dads in your life? Mandee from Designs By Miss Mandee here, and I’ve got a really cute and simple gift idea to share with you. 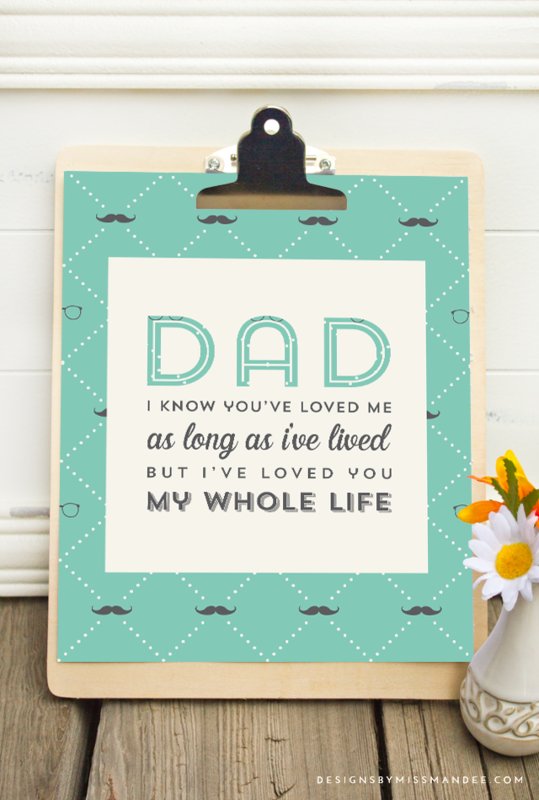 On my blog, I share lots of fun printable designs, and today I’d like to share a printable quote for Father’s Day that is sure to melt dad’s heart. Dad, I know you’ve loved me as long as I’ve lived, but I’ve loved you my whole life. I can almost hear the universal, “Aww, how sweet.” That’s exactly what I said when I first saw this quote, so I just couldn’t resist making it into a printable. Plus, I had just created some fun seamless patterns for Father’s Day, and I was anxious to put them to use! What do you think of the hipster mustaches and glasses? Designs like this are great for quick gifts! Just buy a frame, print out the design, and you’ve got yourself a super cute present for $10 or less (unless you’re someone who likes to buy super fancy frames—then, more power to you)! Last week I shared another printable that can be used as a wedding gift. If you have time to download one more pretty design today, you should definitely check it out. I love my dad so much! In high school, he was always pushing me to work hard and do my best, while never taking life too seriously. And I love that, even to this day, he takes time to tell me that he’s proud of me (is there anything a kid wants to hear more from their parents?). And now that my own husband is a father too, I have the privilege of learning important parenting skills from him each and every day—he’s such a great daddy! Enjoy the freebie, and have a happy Father’s Day! What a sweet sentiment! 🙂 I’m sure any dad would love to get this!